Steven and Sarahi got rid of 80% of their belongings, cut their living expenses by 70%, and saved $50k on their tiny house build. Do you want to learn how to save 30 to 80% on everything you buy for your tiny house? Then this is the interview for you! My guests Steven and Sarahi tell their story of downsizing from a 2,000SF house and a life of overconsumption to a beautiful 350sf “mega” tiny house on wheels. This interview is FULL of creative and useful tips for saving money on your build, so if you’re on a budget, you won’t want to miss my full conversation with Steven and Sarahi. Sarahi started her family’s transition to tiny living by challenging herself not to buy any new clothes for an entire year. That challenge quickly spread to other areas of her life, and that’s when she brought it up with her husband Steven. He wasn’t so enthusiastic. Their 2.5 car garage was so full of stuff that Steven couldn’t figure out where to start. Sarahi decided to start downsizing and getting rid of her own personal things as an example, as well as things that Steven wouldn’t miss. “It was incredibly difficult for me”. Steven immigrated from Colombia as a boy and grew up very poor in New York. He decided to go into finance because he wanted to make money. As he worked his way up the corporate ladder, he collected more and more stuff. The idea of getting rid of stuff seemed anathema to him at first, since he had placed so much of his life’s value into money and things. Once Steven started noticing the positive benefits of Sarahi’s efforts, he got on board. And when he was laid off from his corporate job, he decided to take 6 months off to decompress. He started spending a lot more time with his son, and Sarahi. The lifestyle change was transformative, and Steven realized that he didn’t want to let it go. They owned a 2,000 sf home and a second property that they rented out. But instead, they decided to reduce expenses and transition to the tiny lifestyle. This “mega” tiny house is built on a 36’ x 10’ trailer, and clocks in at 350square feet, not including the loft space. One loft is their son’s room, and the other loft is their “roll in closet”, because they have a rolling stool to move around. A private bedroom converts into an office, and the kitchen is very functional. Steven always dreamed of having a “smart” home, full of technology. Because of the footprint, he was able to put all kinds of app-controlled smart gadgets into the home. Price hacking is looking at alternate and creative ways to get a discount on something, and Steven is full of creative ideas. In fact, he attributes $50k in savings on their tiny house build using price hacking and other techniques. These are some seriously creative and interesting ideas for saving money and you’ll have to listen to the interview for all the details! What is a “mega” tiny house? How to plan a tiny house with kids: What happens as they grow up? 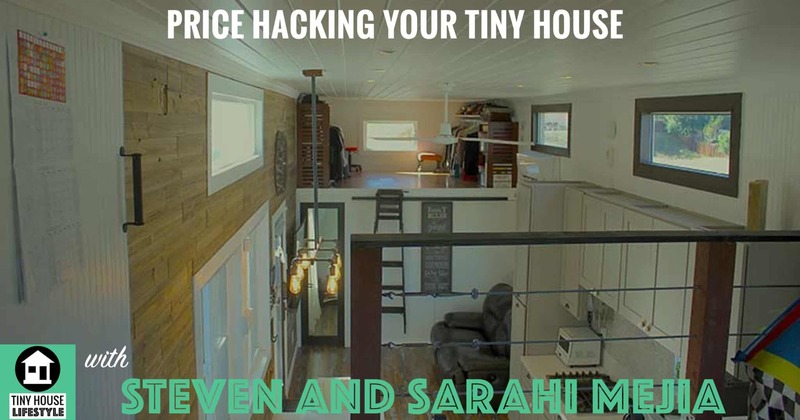 What is price hacking and how do you apply it to building a tiny house? How to use gift cards, rebates, and credit card points to get a 30% discount on EVERYTHING you buy for your tiny house. Is it possible to price hack your tiny house trailer? How to find tiny house parking at a discount in Los Angeles? Why relationship building is such an important skill.